My family's kitchen was the warmest room in the house. It's kind of hard writing this review today, as every room here is the warmest room in the house - our maximum temperature was 35 degrees Celsius, and it is still currently 26 degrees outside (and way hotter inside!). However, Gdula is not referring to the temperature of his family's kitchen; rather, for him, it was the fact that the kitchen was the room where his extended family came together and stayed together as a family, thereby keeping their traditions and their pasts alive, which made it "the warmest room". 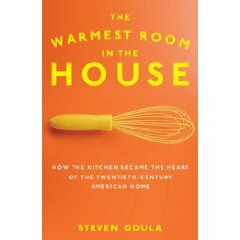 The Warmest Room in the House is a history of the American home kitchen in the twentieth century. It works its way, in chapters divided into decades, through developments and changes in the American home kitchen. Gdula assists readers to understand how the political and social changes which took place inside and outside the home led to corresponding changes in the kitchen. This made Gdula's book an interesting read, despite being purely historical; I would never have imagined that outside events could have such an influence on the domestic sphere of individuals. The kitchen of the first decade of the twentieth century was often a dark and depressing place where only the servants entered. The labour was hard, and women who did not have servants spent much of their time in the preparation and preservation of food. There were none of the mod cons such as electric or gas ovens and refrigerators, and canning and other means of preserving were important. During the 1920s, sweets and soft drinks replaced the prohibited alcohol as a means for people to indulge, which was counter-balanced by the fashion for small figures to fit into flapper fashion. It was the decade in which boxed cereal and sliced bread first hit the shelves, revolutionising the way in which people ate, as these were the beginning of "convenience" foods. The 1930s saw the introduction of many new kitchen gadgets to take the labour out of kitchen chores, such as pressure cookers and sink garbage disposal units. Another important innovation was the gable topped milk carton, because it could be resealed without having a lid. In the 1940s, the war led to unexpected developments in the home kitchen, as freeze-dried meat, the microwave, Teflon coating and aluminium foil came about through scientific research for defence purposes. Additionally, the stimulus to the economy started by the war effort led to affluence in the kitchen, by contrast to the Depression years of the previous decade. Further technological developments in the 1950s meant that people could spend less time in the kitchen, and leisure time came into vogue. Bigger families also led to bigger homes with bigger kitchens, and the development of the open plan living area in ranch style house meant that people could interact with family and friends while preparing food. The invention of the modern electric refrigerator during the 50s revolutionised the way in which food was stored. In this decade, the beginning of the long association between men and barbecues also began. The 1960s began people's awareness of potential food contamination through the very chemicals that were being used to increase yields, such as pesticides, commencing with Silent Spring by Rachel Carson. This led to the birth of the organic food industry. "Non-food" items such non-dairy creamers and artificial sweeteners were invented. The 1960s was also the decade when Julia Child first beamed into American homes, and urged people to ditch convenience foods in favour of cooking from scratch. Weight Watchers and similar organisations were also born during the health conscious 60's. In the 1970s, as both men and women entered into the workforce in greater numbers and became time poor, technological advances in gadgets (such as the food processor and the Crock Pot) and convenience foods (such as Hamburger Helper and frozen dinners) became popular. People also became more familiar with authentic international cuisine such as Chinese, Italian and Greek. The 1980s saw the battle of the bulge launch into full swing, as studies showed that Americans had become unhealthy on high fat and sugar laden diets. Diet books and diet foods were all the rage (as they still are today). Poultry and fish became more popular in American diets than ever before. Chickens became easier and cheaper to raise due to scientific advances in disease control, which helped poultry's popularity on the dinner table. Americans also branched out into more exotic international cuisine, such as Japanese, Vietnamese and Thai. Beautification of the kitchen came into vogue in the 80s through Martha Stewart. In the 1990s, "Frankenfoods" (genetically modified foods) were approved for sale by the FDA, continuing the trend of technological advancements in the kitchen, while at the other end of the spectrum, nostalgia overtook the kitchen, with the re-emergence of the martini and retro-inspired kitchenwares becoming popular. This was also the era when people stockpiled non-perishable foods in preparation for the Millennium Bug which threatened to bite at the turn of the next century. Increases in the price of food during the 90s saw the return in popularity of foods such as the Hamburger Helper, originally developed to help people to save time but which now also helped them to save money by making more of less. The 90s was also the dawn of online grocery shopping - another technological advancement which meant that people could attend to the necessities without ever leaving the house. In its recipes we find our past; in the daily preparation of its meals we celebrate the present; and in our desire to share these recipes, meals, and moments with family and friends again, we look hopefully toward a warm and comforting future. Although I am an Australian, I found Gdula's book interesting, because there are obviously strong parallels between the development of the Australian and the American kitchen, and we have been influenced by similar world events and share many aspects of American popular culture, from television shows through to groups such as Weight Watchers. I enjoyed learning how and why many things that we now take for granted were created, and after reading this history, I am appreciative that I have a modern twenty-first century kitchen rather than a labour intensive turn of the twentieth century kitchen. Gdula clearly demonstrates how wider social, economic and political issues impacts on the domestic life of all Americans (and of course, everyone). Although The Warmest Room in the House is a history book, it is certainly never dull, and makes interesting reading for foodies and modern historians alike. This weekend, I commenced my Christmas baking and preparations in earnest, so I didn't have time for complex side ventures. However, as a simple item that I could take to work to share, I made Clotilde's (of Chocolate & Zucchini) Yoghurt Cake, and threw in a few blueberries for additional flavour. Clotilde tells us that this cake is the first one that French children learn to make because it is so simple - what's not to like about that? She also accurately describes this cake as fluffy and not too sweet. I own Clotilde's first book, Chocolate & Zucchini, which contains this recipe. It is a beautiful book, and well worth the purchase price. There are plenty of recipes, just like this one, with lovely photographs for each recipe, and a nifty set of conversion tables in the back (which I use all the time for oven temperatures when making American recipes). Daring Bakers - Holy Cannoli! My cannoli were made according to Lisa Michele's recipe without any changes, given that I really only had a vague idea what cannoli were and had certainly never tried them before. I only made a half batch of shells, using Marsala, and quartered the given ricotta filling recipe, which contained chocolate, orange zest and nuts. The ends of the cannoli were dipped in chopped chocolate and mixed chopped nuts, respectively. I took the plunge and deep fried my cannoli shells, just as the recipe intended. I am scared witless of deep frying, but I survived intact, despite all of the protesting, popping and spitting from the oil in the pan. Despite my kitchen measuring 29 degrees Celsius on my digital thermometer, I wore a light weight cardigan while frying the shells so that I had some protection for my arms in the event that the pan spat too vehemently and caught my limbs. Unfortunately, I wasn't able to control the oil temperature that well, and some of the shells ended up a little on the dark brown side. I am proud that they turned out warty and ugly, just like they're supposed to. And as for taste - well, once filled with ricotta, they were delicious! When I bit into the crispy shell, it shattered and gave way to the moist, smooth filling inside, with a curious combination of flavours and textures that somehow seemed just right. Thanks to Lisa Michele for being our host this month and introducing me to something entirely new (oh yeah, and making me conquer my fear of the deep fryer). You can get the recipe I used from Lisa Michele's post. To check out the many creative varieties of cannoli dreamed up by the other Daring Bakers, visit the blogroll at The Daring Kitchen. Last Saturday night, I attended my high school reunion. It was one of those occasions where, almost until the last moment, I waivered as to whether or not I'd go. I wasn't one of the popular crowd at school, and did some regrettable things from time to time as all teenagers do, so I wasn't sure I wanted to revisit memories that I'd locked up and thrown away the key on. However, I was brave, and I went. And I am glad that I did. It wasn't the ordeal that I imagined it might be, and dare I say it, I had fun. All that angst for nothing! Tuesday with Dorie this week is a reunion of sorts, in that I re-made the All In One Holiday Bundt Cake, chosen by our host, Britin of The Nitty Britty. Having made one large cake last time, I decided to halve the recipe and make mini bundts this time. I used a silicone pan and a metal pan to do this. All of the bundts in the silicone pan stuck, while none of the bundts in the metal pan stuck. Both pans were treated the same, so I am not sure what the story is. However, I do know that I will be sticking (forgive the pun) with metal pans in the future. As ever, these cakes were delicious - moist, fruity and tangy. It is an absolute keeper of a recipe, and one of my favourite Dorie recipes. You can check out everyone else's All In One Holiday Bundts at the TWD blogroll. If you'd like the recipe, it will be posted on The Nitty Britty. I had a yen to make bread recently, and after flicking through my books, I settled on the Blueberry Lemon Curd Ring on p228 of Artisan Bread in Five Minutes a Day by Jeff Hertzberg and Zoe Francois. My effort, pictured above, doesn't quite look like the author's version, which you can view, together with the recipe, on their website. I'll blame the differences on the fact that my kitchen was pretty hot and steamy and the dough didn't take kindly to being manipulated when it was nearly melting into the tray. The finished product tasted OK, but personally, I'd like more lemon curd in it. My friend Ruth didn't believe me when I said there was lemon curd in this bread (there is half a cup). I'd also probably chill it before making the slashes, because hot dough when slashed just melts back into the slashes. The batter for these cookies smelled devine - I wanted to eat it raw, but didn't. And when they were baking - the smell was out of this world! It was a smell to make you feel happy, full of brown sugar and spicy goodness. I included all of the spices, including the black pepper (which some TWDers balked at), and used treacle instead of molasses. These cookies tasted oh so good - they were crispy at the edges and chewy in the middle, and were densely caramelly delicious. I ate two while they were still warm - I couldn't help myself! I'd definitely make these again - they are fairly low fuss, although you need to freeze the gooey dough for half an hour before baking. You can see what all the other TWDers got up to by visiting the TWD blogroll, and you can obtain the recipe for these cookies from Dorie's book or Pamela's site. Christmas is creeping steadily closer, and preparations are well underway at Chez Cakelaw. Even though I go to my mother's for Christmas, I have for the past few years been making Christmas treats for my friends, which takes some planning to ensure that there is no last minute rush on, say, the depleted condensed milk isle or the dried apricots at my local grocery store. On Sunday, just for fun and to get me into the Christmas spirit, I attended a half day Christmas cake decorating course at Black Pearl Epicure. As you can imagine, in such a short time, we are not going to be creating the Sistine Chapel of cakes, but our teacher, Judy C of Cakes by Judy C, showed us three simple designs. The first was simply sticking lustre dusted Christmas shapes and silver cachous on the cake; the next was creating a holly wreath around the edge of the cake; and the third, which I chose, was a candle design. The hardest part was actually icing the cake itself, not the decorations. To make the candles, we just rolled up sausages of rolled fondant of different sizes, hollowing out the top of each with our fingertip to imitate a "burnt out" look. The candles (and all other decorations) were stuck to the cake with water. We then cut out holly leaves using a holy shaped cutter and green rolled fondant, marking leaf markings with a knife, which we stuck on in a twisty way at the base of the candles. The little holly berries are balls of rolled red fondant. Next, using royal icing, we piped on dripping candle wax and the candle flames, then finally, highlighted the piping with silver lustre dust and put a glow around the flames using gold lustre dust. The ferns were painted on using a dab of Wilton green gel colouring which had been diluted with water to make a paint, while the non-edible ribbons were stuck on last using dabs of royal icing. I think the cake is simple but effective, and Judy C was certainly a good teacher. I hope your own Christmas preparations are going well! On Friday, Fay retired to a life of freedom and cruises - we can't wait to hear what Fay does next! In the usual fashion, I made Fay a cake. She wanted me to make her something new, so I chose the White Gold Passion Genoise from Rose Levy Beranbaum's Heavenly Cakes. It consists of a genoise soaked with passionfruit syrup, filled with passionfruit curd, then topped with a white chocolate cream cheese frosting. 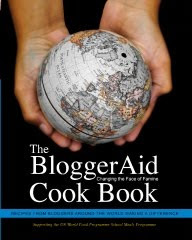 Before I go further, a word from our sponsor - you can now buy the BloggerAid Cook Book online here. Laws of the Kitchen has contributed a recipe, once again using passionfruit, so check it and all the other fabulous recipes out! All proceeds go to the World Food Program's School Meals Program. Here is Fay proudly displaying her cake, even before she knew what sort it was or had tasted it. Love ya Fay! This cake is very involved as far as steps go, so I made the genoise and the curd one night and the syrup and the frosting on the night of assembly. The genoise worked out great - I loved Rose's tips, like combining some of the batter with the melted butter before incorporating the butter into the batter; I found that this prevented an oily separated pool forming at the bottom of the bowl. I also liked her idea of sifting the flour into the batter instead of just plonking some in before folding - it helped a lot in the combination process. The sweetness of the frosting is cut by the sharpness of the passionfruit, and together it makes a wonderful combination. None was left over, even though I cut the cake into tiny pieces for it to go around as far as possible. Preheat your oven to 175 degrees Celsius and grease, flour and line a 9" cake pan with 2" sides. Put the clarified butter in a heatproof bowl and warm it until almost hot, then stir in the vanilla. Cover the bowl and keep the butter warm. In a heatproof bowl, whisk the eggs and sugar together. Put the bowl over a saucepan of simmering water and heat, stirring constantly, until lukewarm. Remove the bowl from the heat and whisk the egg mixture with a stand mixer for 5 minutes or until the mixture has quadrupled in volume. Whisk together 1 cup of the beaten eggs with the clarified butter mixture. Set aside. Sift half the flour over the rest of the egg mixture and fold in with a spatula. Once it has been combined, fold in the remaining flour and finally the butter mixture. Pour the batter into the prepared pan and bake for 20-20 minutes or until the cake is golden and has started to pull away from the sides of the pan. Unmould onto a wire rack sprayed with cooking oil immediately, then, leaving the bottom pan lining in place, turn the cake right side up and leave to cool completely. Whisk the egg yolks, sugar and butter in a saucepan until well combined. Whisk in 5 tablespoons of passionfruit puree and the salt. Cook the mixture on medium-low heat, stirring continuously, until the mixture thickens enough to coat the back of your spoon. Remove the curd from the heat and strain into a heatproof bowl, then stir in the remaining passionfruit. Allow the curd to cool at room temperature for 30 minutes before covering and refrigerating until cool. Put the sugar into a small saucepan, and scrape in the vanilla beans from the split vanilla bean pod, and rub them into the sugar. Add the pod to the pan, and stir in 1/2 cup passionfruit pulp. Bring the mixture to a rolling boil, stirring continuously, then cover it and remove it from the heat and allow it to cool completely. Transfer it to a jug and stir in the rest of the passionfruit pulp. In a stand mixer bowl, whisk the cream cheese and 50g butter until smooth, then beat in the creme fraiche (or sour cream). Gradually beat in the white chocolate mixture and vanilla, then increase the mixer speed and beat until light and creamy. Using a serrated knife, remove the top and bottom crusts of the cake, and cut it in half. Brush the top and bottom of each half with the syrup. Place one half of the cake onto a cardboard cake round. Spread it with 3/4 cup passionfruit curd, and place the other half of the cake on top. Frost the top and sides of the cake with the frosting, swirling the top, and place the cake in the fridge for an hour to set the frosting. Put small dabs of the remaining passionfruit curd on top of the frosting and swirl to combine. I recommend buying Rose's book if you are into making cakes - it is very beautiful and packed with wonderful recipes and tips. Today is the 40th birthday of Sesame Street. I grew up on a steady diet of Sesame Street and Playschool, so Sesame Street holds a special place in my heart. I can't remember for sure who was my favourite character, but I remember being fascinated by Mr Snufalufagus because he was so elusive. I also vividly remember being called "Big Bird" by a much shorter pre-pubescent boy in Grade 7 at Belle & Beau Ball dance practice for Project Club, so perhaps this explains my fascination with Mr Snufalufagus. Wow, that brings back some memories! In honour of Sesame Street's 40th birthday (after all, you don't turn 40 every day), I have made some Sesame Street cupcakes. I found the general idea for the decoration here on Petit Chef. For the base cupcakes, I used my favourite Crabapple Bakery Vanilla Daisy cupcake recipe. For Elmo, I used Wilton red ready-made icing, and piped it on with a plain tip in strands to imitate hair. I then stuck on half of a Delta Cream biscuit from which I had scraped the icing for the mouth, and an orange Skittle for the nose, and finally piped on the eyes using Wilton white ready made icing and Queen chocolate fudge icing. For Oscar the Grouch, I made green buttercream icing which I slathered on roughly to give the effect of fluffy fur, and again used half of a Delta Cream for the mouth (but this time upside down because he's a grouch), and piped on the eyes. I ran out of Wilton white icing for the eyes, and at 9.30pm I wasn't in the mood to make more, so I scraped up the icing from the middle of the Delta Creams into a piping bag and used that to finish the eyes. It worked like a charm! I think these cupcakes are gorgeous. They would be perfect for a children's birthday party, and are fairly easy to make - they just take time and patience to decorate, not to mention some elbow grease if you are using the large Wilton ready-made icing tubes to pipe with! Happy 40th birthday to all the gang at Sesame Street!! At midnight on 9 November 1989, the Berlin Wall began to be dismantled, ending 30 years of separation between communist East Berlin and West Berlin. On Monday night at midnight, the 20th anniversary of the occasion was marked in Berlin with celebrations, including the knocking over of painted foam dominoes to symbolise the coming down of the Wall. I wanted to mark this auspicious occasion, so I have made Berliner Pfannkuchen, a type of jam donut which I understand to be a traditional recipe originating in Berlin. President John F Kennedy is famous for declaring on his visit to Berlin on 26 June 1963 that "Ich bin ein Berliner!" - which unfortunately literally translates to "I am a jam donut!" I used a recipe for Berliner Pfannkuchen that I found on Cast Sugar's site. Like Cast Sugar, I eschewed the traditional dusting of icing sugar for a coating of caster sugar - as I am a sweet tooth too! For some reason, my jam spread inside the donuts instead of being contained in an oozy single centre - but hey, they still tasted good! This is my first ever batch of fried donuts. To all Berliners, congratulations and enjoy this momentous occasion! This week's Tuesday with Dorie is hosted by Em of The Repressed Pastry Chef, who has chosen Dorie's Cran-Apple Crisp. The recipe calls for fresh and dried cranberries. As I didn't have fresh cranberries, I substituted fresh blueberries, hence I ended up with a Cran-Apple Blueberry Crisp. I also didn't have traditional oats, and used quick oats instead, which seemed to work just fine. Stupidly, I halved the recipe (which makes 8 serves) and only made 2 crisps instead of 4. I was puzzled when the fruit filled the ramekins to the brim, and I had to throw away half the topping - and now I know why. I also quite happily ate what I now know was a double serving of crisp - oops. The other one is still in the fridge and will be eaten in two sittings. You can check out how the other TWD bakers went with the cran-apple crisps by checking out the TWD blogroll, and you can find the recipe in Dorie's book or on Em's site. Tonight is Guy Fawkes Night, also known as Bonfire Night. It originates in the UK, and marks the anniversary of the night in 1605 when Guy Fawkes was found with several barrels of gun powder in the cellars of British Parliament to implement a plot to blow up the Houses of Parliament and overthrow the government. The idea of commemorating this event is to remind people of the consequences of treason so that they are deterred from undertaking a similar course to Guy Fawkes, whose fate was to be hung, drawn and quartered. On Bonfire Night, children burn effigies of Guy Fawkes (known as "guys") and bonfires and fireworks are lit to commemorate the event. Traditionally, jacket potatoes, toffee apples, treacle toffee and parkin (a particular form of gingerbread) are shared by revellers on Bonfire Night. Guy Fawkes Night ceased to be celebrated in Australia some time ago when fireworks were banned because of the safety risks. My closest connection to Guy Fawkes Night is my mother's stories of enjoying fireworks with her family. However, in the spirit of the occasion, I have made parkin. I made Dan Lepard's parkin recipe, which you can find here. I omitted the mixed citrus peel, as I didn't have any, and used oats instead of oatmeal (as that is what I had on hand). The result is a delicious, dense, gingery cake that is perfect for taking to outdoor activities on Bonfire Night. To everyone in the UK, I hope that you have an enjoyable Bonfire Night. It's Tuesday with Dorie time again, and this week, our host is Katya of Second Dinner, who chose Dorie's Chocolate Caramel Chestnut Cake. This cake is a doozie - it consists of a base cake laden with nut spread (it's supposed to be chestnut, but chestnut spread being thin on the ground in Brisbane, I used hazelnut spread), filled with a chocolate caramel ganache and chopped tinned chestnuts, then glazed with a chocolate glaze and decorated with more chestnuts. Because of the time and money which goes into making this cake, it is not one that will make its way into my regular repertoire. However, it was delicious, and I would consider it again for a special occasion, perhaps using all hazelnuts, which are easier to acquire and in my view tastier. To see how all the other TWD bakers went, check out the TWD blogroll, and for the recipe, go to Dorie's book or Katya's site.